A CLI tool for finding the time and location of the next JaxNode meeting. This tool can be used to find the next jaxnode meeting. 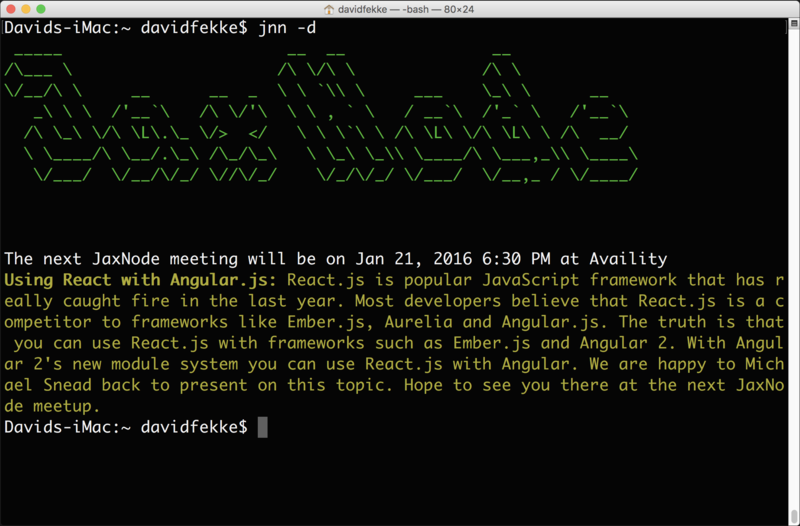 Simply type 'jnn' into your console to find out when and where the next JaxNode meeting will take place. To install this command line utility, use the following example. -e, --easteregg  Tell you friends to 'jnn -e' LoL! The --details option will give you the full meeting title and description. The --map option will open up a Google map in your default browser of the venue location for the next meetup. The --link opens up the JaxNode.com website in your default web browser. We display the next meetup information on our home page. The --address displays the venue address for the next meetup. The --easteregg is, well, you will have to check that one out for yourself.